Answer: Yes, August 2012 will have a Blue Moon on the 31st. And no, it won’t look “blue” despite the name. The Blue Moon you’ve been hearing about refers to the second Full Moon in the same month. During most months, there’s only a single Full Moon. But every 2-3 years you can see two Full Moons in the same month. To understand why this happens, we’ll need to talk about the definition of month. What that means is, there’s no way to get a “perfect” calendar with, say, 30 days in every month, and 12 months in a year. So early astronomers designed the calendar as close to that ideal as possible. And that required months with differing numbers of days, leap years, and the occasional Blue Moon. The graphic at top shows the orbits of Earth and Moon. There are two different ways to time orbits. Sidereal timing is with respect to distant stars, and is used for orbital calculations. It’s what we need to navigate spacecraft. The sidereal period of the Moon is 27.3 days. In that amount of time, the Moon makes one complete orbit of Earth. Synodic timing is measured with respect to the Sun. The Moon’s synodic period is 29.5 days. In that amount of time, the Moon goes through a complete phase cycle. 29.5 days is the time between two Full Moons, and that’s why there will never be a Blue Moon in February, even in a leap year. The graphic shows the difference between sidereal and synodic orbits. 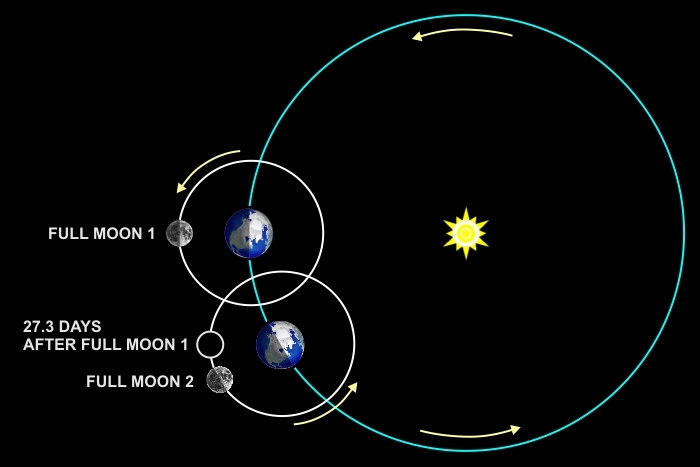 By the time the Moon completes one sidereal orbit, Earth has moved along its orbit by one month (≈ 30°). So the Moon needs to travel along its orbit for another 2.2 days before it again reaches Full phase, completing one synodic orbit. Note: A Full Moon can only happen when Sun—Earth—Moon are all in a line (with Earth in the middle). Weather permitting, I intend to photograph that Blue Moon on August 31st. It’ll rise behind a nearby mountain, so if I’m lucky I might get a nice silhouette of a saguaro cactus in front of it. But remember … it won’t really appear blue. That’s a totally different phenomenon sometimes caused by fine smoke or dust particles in the air. If I get a good photo, I’ll run it next week in Sky Lights. I like the traditional definition – those ole’ Maine Farmers knew what they were talkin’ about! Yeah, I’m aware of the “controversy” regarding whether a Blue Moon is the second Full Moon in a month vs. an extra Full Moon in a season. There doesn’t really seem to be a consensus about that usage, so I opted to explain it on the simpler basis. Whether S&T “corrupted” the original meaning is debatable. Since Sky Lights is targeted for beginners, I wanted to avoid all that complexity. But your point is well-taken. Thanks. I knew it wasn’t blue — but then why do we CALL it blue? As a kid I first heard the expression “once in a blue moon” and only years later knew what it really meant. Logophiles are not sure, but I’ll tell you what I found in my research. The historical record of the term “Blue Moon” just wasn’t solid enough to convince me, but it’s still an interesting story. There is an Old English word “belewe” that could mean either the color “blue” or “betrayer.” Back when the Church started calculating the date of Easter based on astronomical cycles, they decided Easter Sunday would fall on: the first Sunday, after the first Monday, after the first Full Moon, after the Vernal Equinox. When an “extra” Full Moon slipped into the calendar it could really mess up that calculation. As you know, the date of Easter varies widely enough already. And from that came the colloquial meaning of “a rare or unusual event.” The author is unknown, but that proverb is cited in the OED as the etymological origin of that meaning. Those two uses of the term Blue Moon might be related or independent. It all happened so long ago that even the experts aren’t sure.